Fire-fighting jerseys, pants, scarves, team wear | Bison Sportswear. RACERBACK - TOP product for this summer season. The expression: “Not raining, just dripping,” pretty much does not apply to athletes performing fire-fighting sports. Quite the contrary. You can implement it in any fire-fighting sport discipline, but you will always do it to the fullest. Whether you are operating fire hose or fire gun, the Bison jerseys will support you. 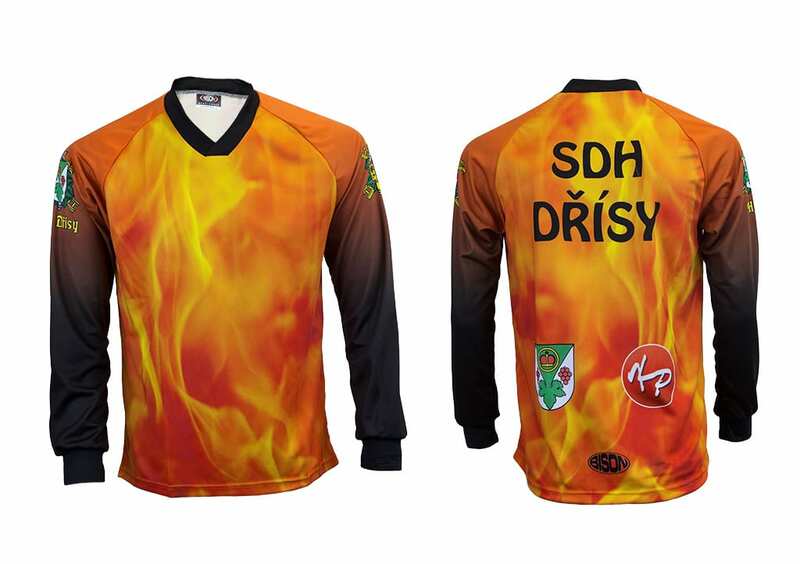 The fire-fighting jersey is manufactured in two versions – the men’s (classical or raglan) and women’s (classical or raglan anatomically adapted to the female body) patterns. Choose from new, attractively designed patterns. You can select the type of the collar, fonts and numbers as you wish. It is suitable to manufacture the jerseys from following materials: CANADA 155 gr., CoMo 160 gr., LION 160 gr., KOSTKA 145 gr., BÁRA 145 gr., GOLF 205 gr. and O-Zone 170 gr. More detailed information about materials can be found here. The basic jerseys size can be determined using size tables. Information on the price can be found in the price list. We have prepared a quality material for the manufacture of single-color elastic pants. The material is very comfortable, consisting of a polypropylene fibers and elastic fiber Lycra, with soft cotton touch. It is exceptionally soft, very light and air permeable. It is characterized by increased non-ceasing property. This material has excellent ability to return to its original shape. Therefore it better adheres back after stretching. Through its increased tightening ability protects the muscles, which is important for sportswear. Newly, we use material that supports these properties to the maximum possible extent. This ensures your comfort and freedom of movement, clothes fits better and maintains its shape. The bottom part of the pants contains knitwear for better fixation. The basic pants size can be determined using size tables. Newly, we offer the possibility to differentiate men’s and women’s pants patterns. The women’s pattern is anatomically adapted to the female body and emphasis the curves of the female body more. Please pay increased attention to the selection of sizes. It is a very important in case of the elastic pants! It is possible adjust the length of your pants or add a zipper to the bottom for easier dressing upon request. Elasticated pants matching the design of the jersey are very popular and currently one of the most sought-after assortments. We would be pleased to create graphics both for individual pants and pants with matching design to your jersey according to your requirements. Material is very comfortable, consisting of a polypropylene fibers and an elastic fiber Lycra, with a soft cotton touch. It is exceptionally soft, very light and air permeable. It is characterized by increased non-ceasing property. This material has excellent ability to return to its original shape. After stretching, it adheres better back to the body. It protects the muscles through its increased tightening ability, which is welcomed by sportswear. Newly, we use material that supports these properties to the maximum possible extent. This ensures your comfort and freedom of movement, clothes fits better and maintains its shape. The bottom part contains knitwear for better fixation. The basic pants size can be determined using the size tables. Newly, we offer the possibility to differentiate men’s and women’s pants pattern. The women’s pattern is anatomically adapted to the female body and emphasis the curves of the female body. Please pay increased attention to the selection of sizes. It is a very important in case of the elastic pants! If you have a larger pants, you will not fully take advantage of material properties. On contrary, if they are smaller, they will be too tight, which may affect the appearance of the print. It is possible to adjust the length of the pants (minimum adjustment of 5 cm) or add a zipper to the bottom for easier dressing upon request. Loose sublimation sweatpants are an excellent choice for those who do not feel good in the elastic pants, yet require design matching the jerseys. 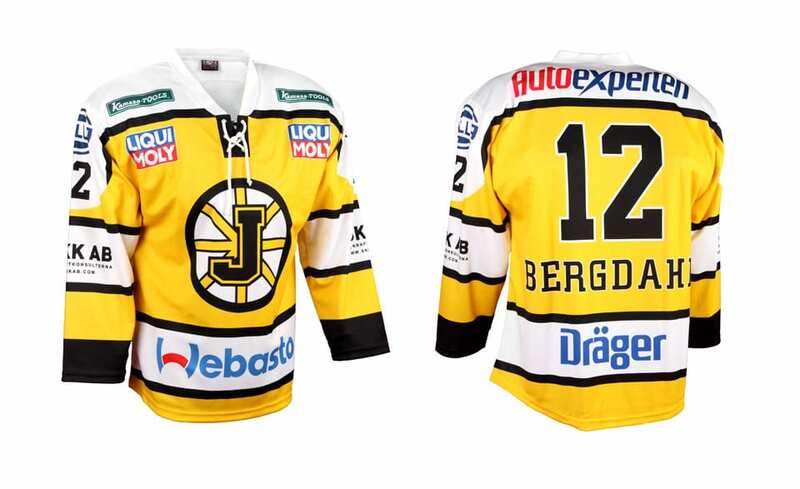 We would be pleased to create graphics for pants matching your jerseys according to your requirements. Material is very breathable and comfortable for a pleasant feeling when wearing it. A broad elastic band with a drawstring is located in the waist area. The bottom part contains knitwear for better fixation. The basic sweatpants size can be determined using the size tables. It is possible to adjust the length of the pants upon request. We offer the possibility of diferentiate between men’s and women’s patterns also in case of these pants. The women’s pattern is anatomically adapted to the female body. Information on the price can be found in the price list. We have prepared a quality material for the manufacture of single-color elastic pants. The material is very comfortable, consisting of a polypropylene fibers and elastic fiber Lycra, with soft cotton touch. It is exceptionally soft, very light and air permeable. It is characterized by increased non-ceasing non-ceasing property. This material has excellent ability to return to its original shape – it adheres back better after stretching. It protects the muscles through its increased tightening ability, which is important for sportswear. Newly, we use material that supports these properties to the maximum possible extent. This ensures your comfort and freedom of movement, clothes fits better and maintains its shape. The bottom part contains knitwear for better fixation. The basic pants size can be determined using size tables. Newly, we offer the possibility to differentiate men’s and women’s pants patterns. The women’s pattern is anatomically adapted to the female body and emphasizes the curves of the female body more. Please pay increased attention to the selection of sizes. It is a very important in case of the elastic pants! It is possible to adjust the length of the pants or add a zipper to the bottom for easier dressing upon request. Loose sweatpants are an excellent choice for those who do not feel good in the elastic pants. Material is very breathable and comfortable for a pleasant feeling when wearing it. A broad elastic band with a drawstring is located in the waist area. The bottom part contains knitwear for better fixation. The basic sweatpants size can be determined using size tables. We offer the possibility to differentiate men’s and women’s patterns also in case of these pants. The women’s pattern is anatomically adapted to the female body. It is possible to adjust the length of the pants upon request. The basic fire-fighting sweatpants size can be determined using size tables. More detailed information about materials can be found here. Information on the price can be found in the price list. The multifunctional tube fire-fighting scarf is a suitable supplement for most outdoor sports. It is manufactured from elastic polyester micro-fibre which is soft and pleasant to touch. It does not cool you and does not absorb the sweat, on the contrary, it takes it to the surface. The scarf is a lightweight and flexible. Its size is universal and it will adapt to all users. The multi-tube scarf protects you in all weather conditions against sun, winter, sweat and dust. The way of use is really wide. You can use it as a scarf, hood, mask, neck warmer, cap, or headband. It is really up to you. Here are some inspirational examples of using scarves. Maintenance of the tube-scarf is easy. It can be washed in automatic washing machine and does not need to be ironed. As one of the few manufacturers we offer you a possibility to have a scarf in your own design. See examples of the use. More detailed information about the material used can be found here. Information on the price can be found in the price list. Pokud si nevyberete žádný model dresu z naší nabídky pro hasiče, nebo požadujete dresy v originálním designu Vašeho hasičského sboru, můžeme v našem grafickém studiu společně s vámi vytvořit dresy podle vašich představ. 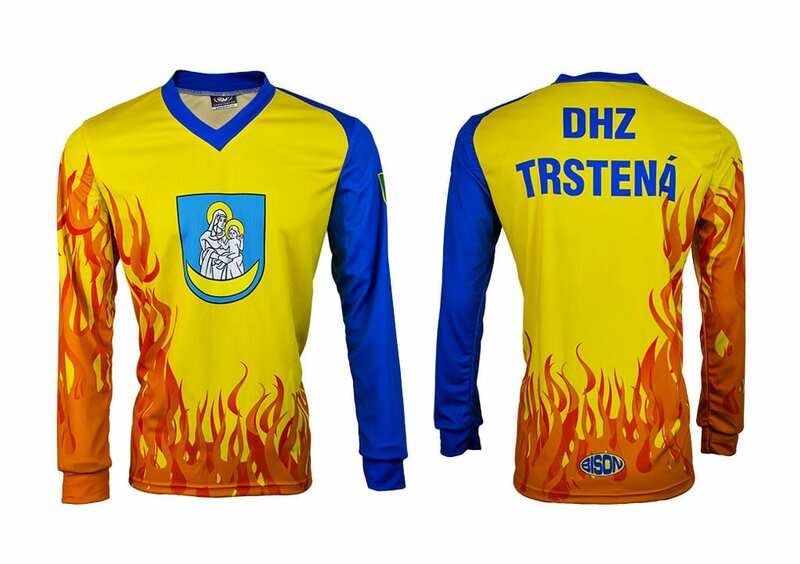 Příprava grafického návrhu je zdarma. Samostatná výroba dresů se vždy uskuteční až po odsouhlasení vzorků nebo tiskových náhledů. V případě ztráty nebo zničení vašich současných dresů vám rádi zkompletujeme neúplné sady zhotovením podobných dresů tak, abyste i nadále mohli tyto dresy používat.